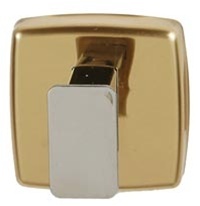 Brey-Krause's Sophisticate 4800 line of washroom accessories combines the beauty of brass with the durability of stainless steel. These washroom accessories are a perfect fit for a commercial or residential facility where a less institutional and more upscale look is preferred. The 4800 line posts are fabricated from 304 series stainless steel and welded to form an integral unit with the bright polished brass flange and mounting bracket. The assembly mounts to a wall bracket using a set screw. All fasteners are supplied. S-4833-BB - Single hook- 4-1/4" proj. S-4842-18-BB - Round towel bar- 18"
S-4843-18-BB - Square towel bar- 18"
S-4842-24-BB - Round towel bar- 24"
S-4843-24-BB - Square towel bar- 24"
S-4842-30-BB - Round towel bar- 30"
S-4843-30-BB - Square towel bar- 30"
S-4873-18-BB - Utility shelf- 18"
S-4873-24-BB - Utility shelf- 24"
S-4872-18-BB - Towel supply shelf-w/o bar-18"
S-4872-24-BB - Towel supply shelf-w/o bar-24"
Towel supply shelf-w./ bar- 18"
S-4874-18-BB - Towel supply shelf-w./ bar- 18"
S-4877-18-BB - Towel supply shelf w. bar&brace-18"
Towel supply shelf-w/ bar- 24"
S-4874-24-BB - Towel supply shelf-w/ bar- 24"
S-4877-24-BB - Towel supply shelf w. bar&brace-24"